The flowchart at the beginning of this page summarizes the application of the regulations in deciding when a flowchart is required by the regulation. The OSHA respiratory protection standards were revised on January 8, 1998 and subsequwntly, these are current through 2015. This PDF provides a simple, easy to understand and follow guide to the requirements of the OSHA Respiratory Protection Standard. 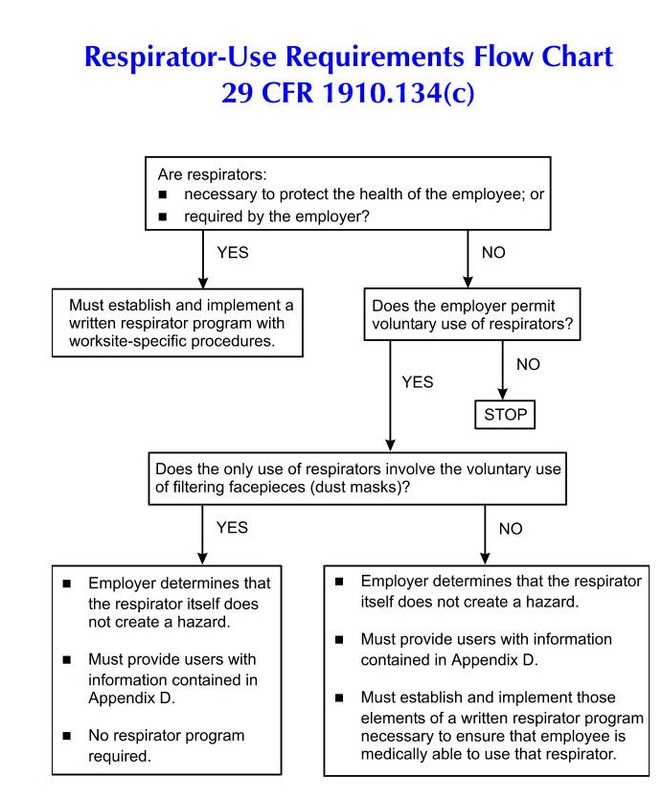 OSHA's revised Respiratory Protection Standard (29 CFR 1910.134 and 29 CFR 1926.103) went into effect April 8, 1998. The final standard replaces the respiratory protection standards adopted by OSHA in 1971. The 29 CFR 1910.139 respirator standard that applied only to respiratory protection against Mycobacterium Tuberculosis was withdrawn December 31, 2003. Establishments whose respiratory protection programs for tuberculosis formerly covered under 29 CFR 1910.139 were required to adapt their programs to comply with the requirements of 29 CFR 1910.134 effective July 2, 2004. Respiratory protection is also addressed in standards specifically for the general, shipyard employment, marine terminals, longshoring, and construction industries. The respiratory protection standards for the shipyard employment (29 CFR 1915.154), marine terminals (29 CFR 1917.92), longshoring (29 CFR 1918.102), and construction industries (29 CFR 1926.103) reference the respiratory protection standard for general industry (29 CFR 1910.134).